Jazz at Lincoln Center Orchestra. BSO photo by Hilary Scott. Musicians: Wynton Marsalis, music director, trumpet; Ryan Kisor, trumpet; Kenny Rampton, trumpet; Marcus Printup, trumpet; Vincent Gardner trombone; Chris Crenshaw, trombone; Eliot Mason, trombone; Sherman Irby, alto and soprano saxophones, flutes; Ted Nash, alto and soprano saxophones, flutes; Victor Goines, tenor and soprano saxophones, clarinet, bass clarinet; Walter Blanding, tenor and soprano saxophones, clarinet; Paul Nadzela, baritone and soprano saxophones, bass clarinet; Dan Nimmer, Piano; Carlos Henriquez, bass; Ali Jackson, drums. Last night in Ozawa Hall jazz trumpet player Wynton Marsalis dedicated a performance of Jazz at Lincoln Center Orchestra to the memory of Gunther Schuler who passed away on June 21. Studying with Schuler, who performed on the seminal Miles Davis 1949-50 recordings collected as “Birth of the Cool” proved to be a transformative experience. As it was for so many inspired by his great range of musical interests. During the former Tanglewood Jazz Festival Schuller returned to Lenox to lead an orchestra in a work by Charles Mingus. Uniquely, Marsalis has won Grammy awards for both classical and jazz recordings. In addition to being the foremost trumpet player of his generation Marsalis, who comes from a musical family in New Orleans, is an authority on the history of jazz and preserver of its legacy. Seated in the back row’s trumpet section he introduced each composition during an evening of music from the swing bands of the 1930s to recent works by members of the orchestra. 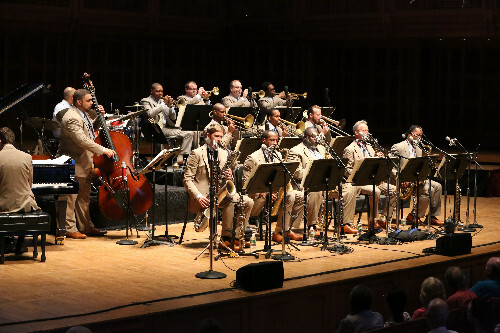 The first part of the program focused on historic jazz while the second half explored the big band as an enduring and vital presence. Introducing a piece by Dizzy Gillespie from the Be Bop era he noted how Gillespie hated the term for post war experimental jazz. Marsalis observed that the more you hate a nickname the more likely it is to stick. He noted that during the era of Bop there was a real battle in the jazz world between old and new forms of music. With comic flair he noted that with the passage of time all forms of music are old. The jazz media of the time often threw gasoline on the alleged tensions between bop and traditional jazz. In reality Marsalis commented that Dizzy bought a house in Armstrong’s neighborhood so he could fall by and dig Pop’s stories. Dizzy in turn was later dissed by Miles. And so it goes. Having listened to jazz since the 1950s it was a thrill to hear this wonderfully balanced program. The first half represented the music I grew up with that formed the foundation for a lifelong love affair with all forms of jazz. What most appealed to me was that when performing iconic works the Lincoln Center Orchestra didn’t attempt to reproduce the arrangements. If you were familiar with the classic recordings you would be aware of the invention and improvisation of this magnificent group of musicians. This was particularly true of Marsalis who displayed a virtuoso's command of the plunger mute style which was invented by Duke Ellington’s musicians creating the Jungle Music growling sound of his Cotton Club era. Marsalis evoked the shades of Bubber Miley and Tricky Sam Nanton. Miley who invented the technique died at 29 in 1932. The plunger is manipulated in front of the bell of a horn to muffle and blur notes. It is most associated with Ellington but Marsalis also used the technique extensively in his own composition that ended the diverse program. For the opener the orchestra performed a Benny Carter, 1930s composition "Symphony in Riffs." Known as The King for his command of a range of brass and reed instruments Carter was a progressive player in the era of Big Bands which largely played dance music. Marsalis recalled performing “under his baton” on several occasions. Also from the 1930s they performed the Ellington standard “Mood Indigo.” I vividly recall hearing that evocative, richly toned composition in the mid 1950s at Storyville in Boston’s Copley Square. For this performance Marsalis introduced it with an extended solo before the combination of tenor sax, clarinet and trombone. It was co composed with clarinet player Barney Bigard. As the excellent Terry Teachout biography informs us Duke often wrote out improvisations by his musicians and put his name (and subsequent royalties) on them. The rendering last night was just lovely as the clarinet of Victor Goines put a different twist on what one remembers of the Bigard recording or the wonderful Jimmy Hamilton versions I recall during the many times I heard the band. From George Gershwin their version of “Fascinating Rhythm” featured Don Redman’s arrangement for three trombones. Through the evening we would hear a lot from this section. "Moody's Mood for Love" is jazz saxophonist James Moody's 1949 instrumental solo based on Jimmy McHugh's 1935 song "I'm in the Mood for Love" with lyrics later added by Eddie Jefferson. Moody was a particularly lyrical player and his improvisations were embraced by bop singer Jefferson (who toured with Moody) and then adapted by one of my all time favorite singers the obscure and mysterious King Pleasure. The Pleasure version of the song became a hit when it was released in 1954. It was a duet with cabaret singer Blossom Dearie. I later asked her about Pleasure but she simply responded that she was hired for the session and that was it. Pleasure also recorded memorable duets with a young Annie Ross prior to the forming of Lambert, Hendricks and Ross. Last night the vocal parts were performed with mixed results by two members of the trombone section. This included a faltering falsetto for the Dearie part. The intensity of the first set peaked with a scorching rendering from Dizzy’s big band era the prophetic “Things to Come” from 1943. In many ways the bop experiment marked the end of the big band era. After the war the style changed and only a handful of the big bands including Ellington and Basie struggled to survive. Later Stan Kenton put a band back on the road in the 1960s until his death in 1979. That Gillespie work which has the orchestra pulling out all the stops provided an nice segue into the contemporary part of the program. It opened with a Latin beat in a composition by the bass player Carlos Henriquez. “2/3 Adventure.” It was inspired by a tour of Cuba with the Marsalis ensemble. The trombonist Chris Crenshaw’s 2012 composition had a spirituals texture evoking the prodigal son whose arms are not long enough to box with God. Pianist Dan Nimmer composed a suite of works based on inspiring speeches. They performed the selection “Destiny” based on an address by the Indian leader Nehru. There was a new arrangement by sax player Sherman Irby of a Wayne Shorter composition written when he was with drummer Art Blakey’s Jazz Messengers. Marsalis commented with a Miles like exclamation the reaction of Shorter recently when hearing the new arrangement. Which brought us to the anchor leg of a stellar Tanglewood evening. They brought it all back home with the Marsalis composition “Back to Basics.” It tapered off in a goofy manner with Marsalis crouched down out of sight, in every sense, playing ever softer and wispy plunger mute. The sensational concert, indeed how poetic, ended with more of a whimper than a bang.